This article explores the relation between nanotechnology and the public in India. Nanotechnology is expected to have far‑reaching consequences for developing countries and India has been particularly active in supporting the technology. This article contributes to the emerging literature on nanotechnology and the public by using a concept of the public that diverges from conventional accounts. Rather than assuming the public view coincides with the average opinion of the population of a certain territory, this article uses a concept of the public that was developed by the pragmatist philosopher, John Dewey, who defines the public in relation to the issue at hand. As an experiment, this article empirically studies the views of issue‑based publics by analyzing the nanotechnology coverage of the Times of India. 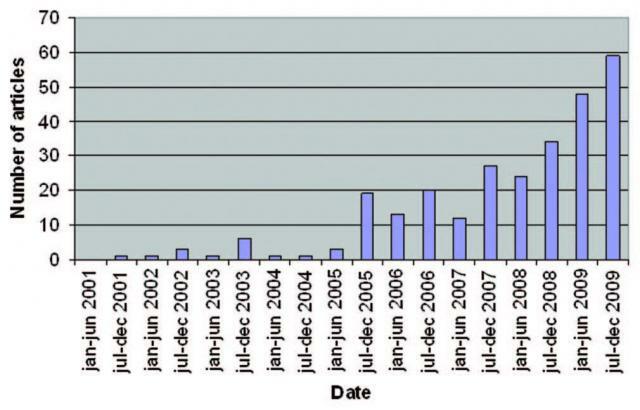 A total of 273 articles were identified between 2000 until 2010. The findings suggest that the main issue is the concern of missing out on the benefits of nanotechnology, in particular for various social groups in India and for the country itself. The view of the issue‑based public is that more care is required for the positive consequences of nanotechnology to land in India. Beumer K. Publics, Issues, and Nanotechnology in Indian News Media. Journal of Scientometric Research. 2015;4(3):143-152. doi:10.4103/2320-0057.174862. Nanotechnology and Development: What’s in it for Emerging Countries?